Snack time is full of fresh surprises with the Mega Bloks First Builders Lunch Box Market! 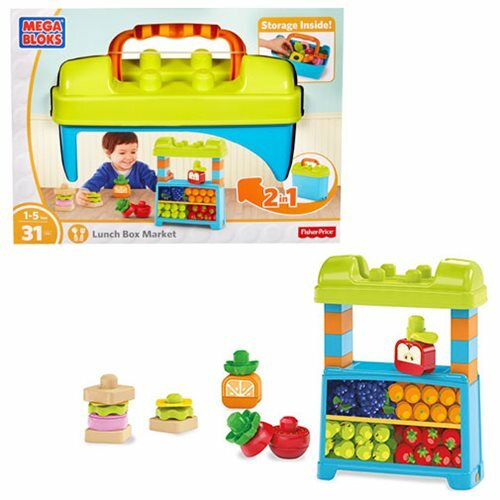 Featuring two ways to play, this colorful lunch box opens up, transforming into a buildable market stand where your little one can set up shop and sell their fruits and veggies! Made for little hands and growing minds, the set comes with big blocks and special parts that you can use to build healthy treats, like an apple, tomato, orange even a giant, stacking sandwich! Create your snacks any way you want, then share with friends, learning creativity, cooperation, and self-expression along the way. When the market closes for the day, put everything away inside the lunch box for quick and easy cleanup! Box measures 12-inches long by 5-inches wide by 11-inches tall. Contains 31 pieces. Ages 1 to 5.